Looking for a quick and easy way to get a custom URL for your Ning Network? 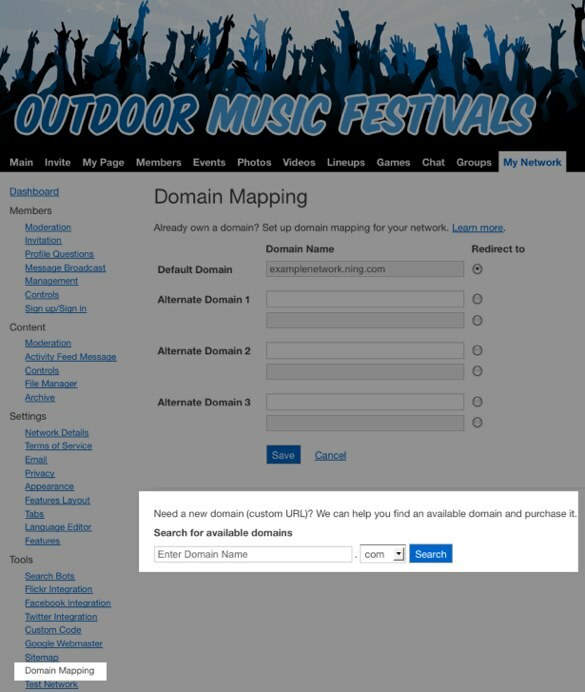 Head over to the My Network page, then go to your Domain Mapping page and search for the domain you want. You can also search directly atÂ Ning Names. 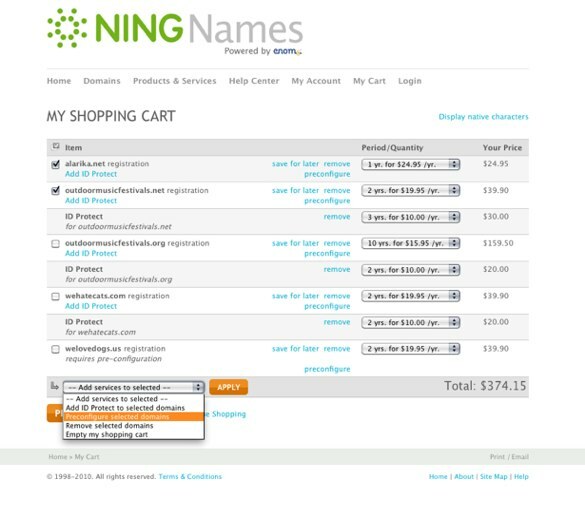 You’ll be taken to a search results page onÂ ningnames.com, where you can see the availability of your preferred domain. This page also lets you easily select to register other top-level domains (.net, .org, etc.) and see alternatives to your search, in case it’s already registered. 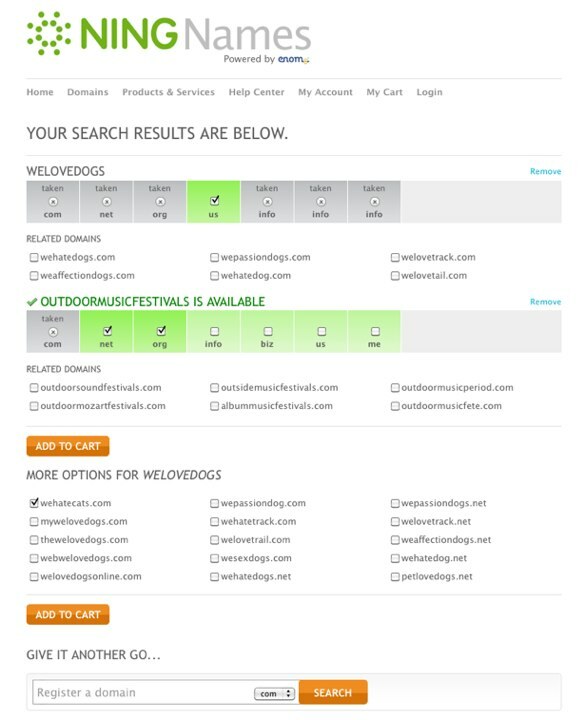 In this example below, we searched for the domains welovedogs.com and outdoormusicfestivals.com and were provided with those domains and any top-level domains currently available for use, along with possible alternate domains we might be interested in. Adding the “ID Protect” service for $10.00/year provides you with a way to protect yourself from spammers. Adding the “Preconfigure the selected domains” service just means that contact and organization information isÂ automatically configured (this is required occasionally by country code registries). You can search for more domains by using the “Continue Shopping” link. When you’re happy with your cart, click “Proceed To Checkout” and either create a new account or login with an existing one. 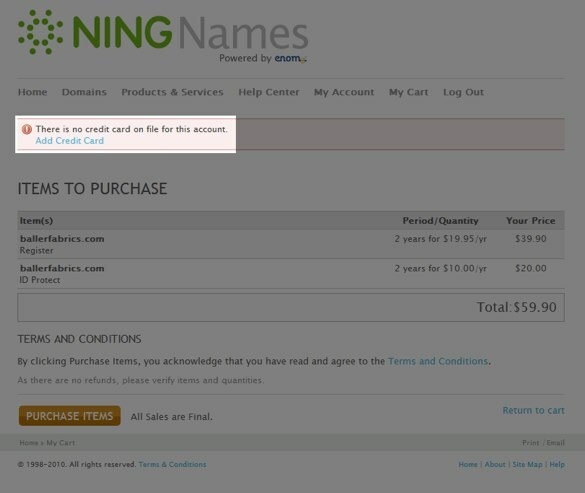 You will need a new Ning Names account -Ning sign in credentials won’t be recognized. Creating a Ning Names account is easy. Just fill in the required information fields and select a Login ID to use for future Ning Names use. Once you’re done, you’ll receive a confirmation email with your credentials. Click the “Checkout Now” button, and review your purchase items. Once you’re satisfied, click “Purchase Items.” Please be aware that all sales are final. If you haven’t added a credit card to the account, you’ll be presented with a message with a link to “Add Credit Card.” Clicking that link will pop up a form where you canÂ input your credit card details. 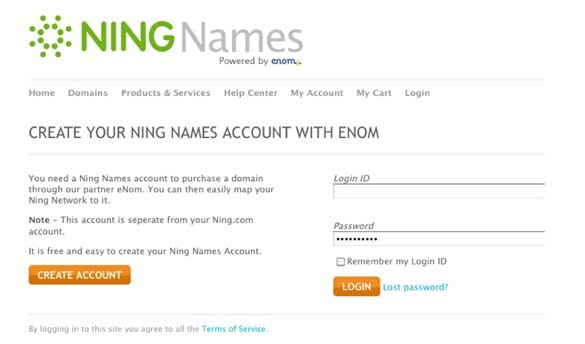 After you have purchased your domain, you will have your very own Ning Name domain name! To set up your domain name settings, check out “Using Your Own Domain from Ning Names“.